newest addition at Dream Machines next to Mr. D’z. There are so many exciting things to share this morning that I am not really sure where to begin. Perhaps the best bet would be to start with the explanations for this post title. Let’s start with a bit of fun, and then I will provide details about discounts. That will be followed with information about pending detours and a couple of adventures. If your cruising Route 66 in western Arizona this weekend, or are on the way to Las Vegas, we have a lot of fun filled activities scheduled in Kingman. The Mohave County Fair at the Mohave County Fairgrounds will run through Sunday evening. On Saturday we have Chillin’ on Beale, a free and fun filled evening that includes cruising, cars, and Cinema Under the Stars hosted by the Route 66 Association of Kingman. The event kicks off around 6:00 PM, and the movie on the corner of Fourth Street and Andy Devine Avenue starts at 8:00. Bring your chairs and enjoy a showing of Roadhouse 66. Add dinner at the Garlic Clove, Sirens, El Palacio, Mr. D’z Route 66 Diner, or Redneck’s Southern Pit Barbecue, and something cold to drink at the Wine Cellar, House of Hops, or Black Bridge Brewery and it should be a perfect night to hang out in the cities historic district. You might also want to check out Dream Machines located in the former Dunton Motors dealership building next to Mr. D’z. They will be relighting the restored circa 1960 OK Used Car neon sign on Saturday evening. Next weekend is the Best of the West Festival. This will blend the cities rich western heritage, including the 45th annual Andy Devine Days Parade and a celebration of its 89 year association with Route 66 into what promises to be a delightful event. Several weeks ago I wrote about developments at Tap Duncan’s historic Diamond Bar Ranch located sixty miles north of Kingman via Stockton Hill Road. 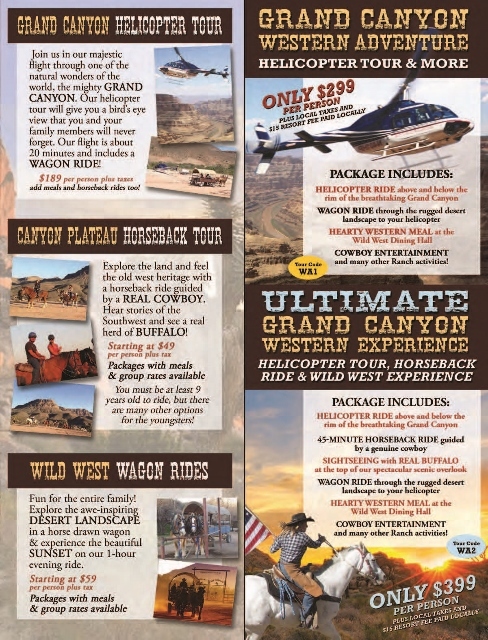 Today the property is home to Grand Canyon Western Ranch, a delightful resort complex that provides the visitor with an opportunity to immerse themselves in a western heritage experience. Well, in support of my ongoing endeavors to promote Kingman as a vacation destination for Route 66 enthusiasts under the 160 Miles of Smiles promotional campaign Robert Bravo, the marketing manager for the ranch is offering a special on packages that ranges from a simple wagon ride to the ridge line at sunset (where the buffalo roam) to helicopter rides into the western end of the Grand Canyon. Simply use promo code “Hinckley” when booking to receive a 10% discount. In addition to offering the visitor a unique and memorable experience, the ranch has a wonderfully rustic full menu restaurant, and a variety of lodging options that will enhance a visit. The bonus is the fact that the drive from Kingman is through stunning and diverse western landscapes. I have two more Kingman area specials for you. Catch me along the road during our trip in October, or the Miles of Possibilities events in Edwardsville, Illinois in October, and I will provide you with a card for a special $59.95 room rate at Grand Canyon Caverns Inn. Next, make plans for a very full weekend in Kingman that kicks off on Friday evening, October 16 with a reception for the National Route 66 Motor Tour at the Powerhouse Visitor Center. That will include a special anniversary celebration of the Route 66 Electric Vehicle Museum. Also scheduled for this exciting weekend is a bluegrass festival at Stetson Winery, and a second annual mountain biking event along the challenging Cerbat foothills trails near the site of historic Fort Beale just a short distance north of Kingman. The last Chillin on Beale for 2015, and the Route 66 Association of Kingman sponsored Cinema under the Stars takes place on Saturday night. Ramada Kingman, the renovated 1965 Holiday Inn, is offering a special package that includes lodging and breakfast, as well as an evening with artist Len Nordmann. The next topic for discussion, adventures. Recently, I was quite privileged with an opportunity to assist in the organization of a reception and ceremony for Dries and Marion Bessels, 2015 inductees into the Route 66 Walk of Fame. This video of the event was prepared by the quite talented Frank Kocevar. Arrangements are being finalized for our adventure to the events in Ewardsville, which usually provides ample opportunity for interesting detours. I hope to see you on the road, or at the festival. Between then and now, there is a presentation pertaining to tourism to be made before the city council of Kingman. There is also an opportunity to visit with Zdnek Jurasek and his wife Eva, also inductees into the walk of fame, and their tour, Jan Kuperus of U.S. Bikers, and Akio Takeuchi, an acclaimed Japanese author and passionate Route 66 enthusiast. 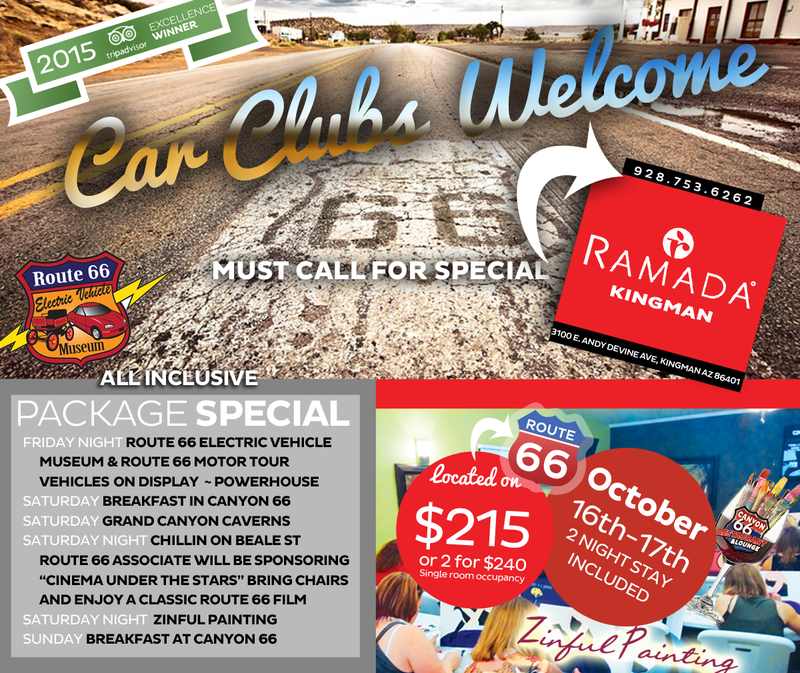 September 18, 2015 (Kingman, AZ) The Route 66 Association of Kingman is proud to announce that it has partnered with 66 Celebrates 90 to promote events and programs to help celebrate the 90th anniversary of Route 66! The numerical designation “66” was assigned to the Chicago/Los Angeles route on April 30, 1926 and was officially established on November 11th, of that same year. Starting in April 2016, the 66 Celebrates 90 committee will promote events the third Saturday of each month in conjunction with Chillin’ on Beale St. in Kingman. These events will help bring attention to the important role that Route 66 has played in the history and the future of Kingman, AZ. They will also be a driving force in bringing more visitors to Kingman. In coming weeks the Route 66 Association of Kingman directors will issue a goals statement & Calendar of Events for 2016 and an outline for bringing them to fruition. A key component to moving some of these projects forward will be letters of endorsement for 66 Celebrates 90from business owners, Route 66 Associations, and elected officials. 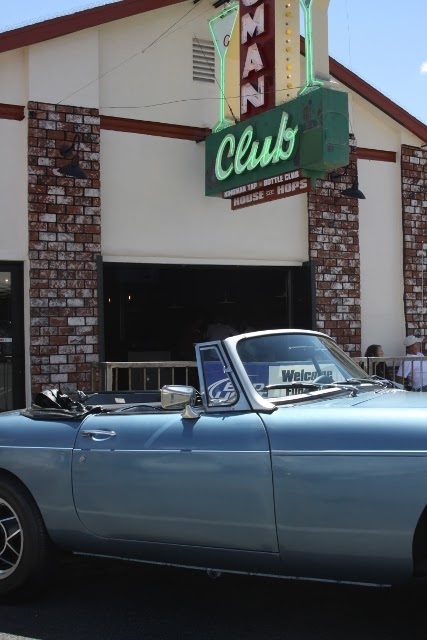 · The morning of September 30 Zdnek Jurasek, President of the Route 66 Association of the Czech Republic and an inductee into the walk of fame, will be in Kingman with his tour from the Czech Republic and a ceremony will be held at Mr. D’z at 8:00 am. · On the evening of October 24th, Adventure Caravans will be in Kingman for two days. Arrangements have been made for special activities at the Powerhouse Visitor Center. The company’s second fall tour will stop in Kingman on the 31st. · Scott Dunton has restored a circa 1960 neon OK Used Cars sign. This will be installed at Dunton Motors Dream Machine soon, and plans call for an official lighting during the September Chillin’ on Beale. · Jim Hinckley will be addressing the Miles of Possibilities Conference, a part of the Route 66 convention, in Edwardsville, Illinois at the end of October. Details about the trip and his presentation are forthcoming. For more information and sponsorship opportunities for the Route 66 Association of Kingman or 66 Celebrates 90 call Jim Hinckley at 928/897-7766 or Jamie Selby Taylor of JuST Marketing at 928/530-2056.